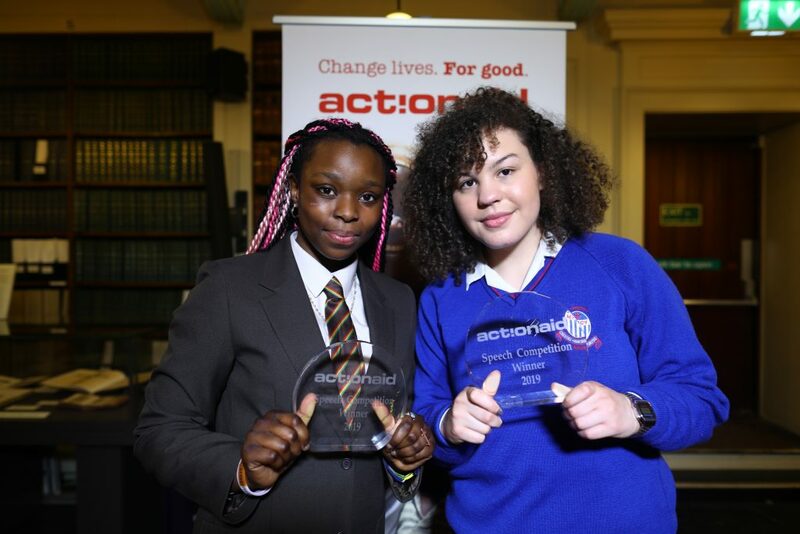 Clodagh Boyce, a student at St Joseph’s Mercy Secondary School in Navan and Kirsten Soney-Ituen, a student at Gaelcholáiste Cheatharlach in Carlow have won the national ActionAid Speech Writing Competition 2019. Gavin Jennings (Presenter on RTE’s Morning Ireland). Aoife Ní Fhearghail (Deputy Director, Civil Society and Development Education Unit, Irish Aid). Moira Leydon (Association of Secondary Teachers of Ireland). All Finalists saw off competition from over 150 entries from over 50 schools across the country. As a result, judging on the day was not easy. The competition is part of ActionAid’s women’s rights programme, funded by Irish Aid. The programme promotes engagement with the Irish public to raise awareness about global issues. The women’s rights programme, nominated for a Dóchas innovation award in 2018, works to end early girl marriage, prevent gender-based violence, gain land rights for women and help children receive an education. ActionAid Ireland uses a Behaviour Change approach in Ethiopia, Kenya and Nepal. As a result, the approach is helping participating women and girls, men and boys, and traditional and cultural leaders to move away from damaging behaviours. The speeches, which all looked at gender equality in different contexts, were judged on delivery, writing skills and understanding of the topic. While all the finalists demonstrated a keen interest in women’s rights and an understanding towards the topics, on the day there had to be two winners. However, the two winning students stood out for their originality, depth of research and critical thinking. The two winning students will visit ActionAid’s new programme in Greece with their teachers. There they will learn more about ActionAid’s Protection and Empowerment Program working with refugee women living in areas of Athens. And they will also visit the Athens support centre, which supports Greek people facing financial problems and social exclusion. And so the visit will give students a taste of ActionAid’s programme approach and work with women on the ground. Pictured are speech winners: Kirsten Soney-Ituen (left) and also Clodagh Boyce (right) with their trophies.